Get your daily scoop of what State of the Union is watching today, January 3, 2014. 1. Christie's holiday greetings to Iowa. Laying the groundwork for 2016 or just a friendly holiday greeting? Either way, Iowa Republican lawmakers appreciate the love they're getting from Chris Christie. A handful of them received Christmas cards from the New Jersey governor. The front of the card, which was first reported by Buzzfeed, features a photo of the governor and his family on stage during Christie's November acceptance speech after convincingly winning four more years as governor of New Jersey. Inside, the card reads "Wishing you peace and happiness this holiday season and throughout the coming year." Peter Cownie, a Republican member of the Iowa state House, said he thought it was a novel and interesting tactic for a Republican governor. "I consider it pretty smart, innocuous way of introducing himself to Iowans," Cownie said. "You have to work hard out here in the caucuses and this is an introduction, so to speak. This is a way to do that. I think we all kind of know what is going on." 2. Wisconsin's "Unintimidated" governor. Chris Christie isn't alone in trying to shift the spotlight from unpopular Republicans in Washington. Wisconsin Gov. 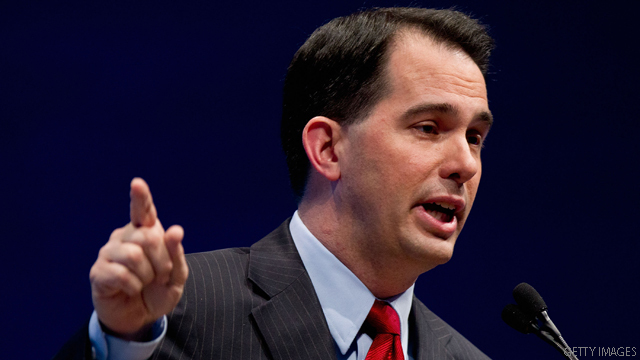 Scott Walker is also getting some national buzz. He's been mentioned as potential 2016 White House contender and an example of GOP governors who are getting things done in the states. Walker will talk about the future of ObamaCare and his party's political prospects when he joins State of the Union this Sunday. 3. White House responds to SCOTUS. The Obama administration is asking the Supreme Court to keep in place a requirement that some religious-affiliated employers include birth control and other reproductive health services in their employee insurance plans. The Denver-based Little Sisters of the Poor catholic charity filed a lawsuit against the federal government claiming the requirement violated the group's religious freedom. Supreme Court Justice Sonia Sotomayor on Tuesday issued an emergency stay exempting some employers from the rule pending a response from the administration. The full court will hear arguments on the issue later this year. 4. Jobless benefits on Senate docket. The Senate returns to work Monday and will vote on a three-month extension of unemployment insurance that ended for more than a million Americans at the end of last month. The bipartisan measure is sponsored by Democrat Jack Reed of Rhode Island and Republican Dean Heller of Nevada. "It's not determined yet, but we're going to do everything we can," Reed told the Washington Post. "Hanging in the balance is probably the right way to say it." The White House supports the extension of jobless benefits through 2014. Get the White House's 2014 game plan for the economy and ObamaCare when National Economic Council Director Gene Sperling joins State of the Union this Sunday.